Online map sharing and lots of puzzle variety are good. Easy difficulty and wonky control issues... not so good. Mario Vs. Donkey Kong 2 would probably have been better off if it were branded as something else entirely, so as to not be compared to the original Mario Vs. Donkey Kong. That game was so good, (as was the grandfather of all Nintendo platform puzzlers Donkey Kong '94), that as a sequel, March of the Minis can't help but disappoint. Perhaps instead of leading mini Marios around the peril-filled stages, they could have been Pikmin, and this game named Pikmin Puzzle or something similar. As it is, March of the Minis is a far cry from being a poor title, but it neither does it come very close to living up to its predecessor. The experience is essentially pure puzzle-solving, with the platform elements dropped entirely. Instead of controlling Mario as he navigates his way through switch, conveyor belt, and spring-filled levels, this time gamers are tasked with getting the mini Mario toys found throughout the stages safely to the goal. The toys aren't controlled directly - instead the stylus is used to direct their movements. Slide the stylus across their body and they'll walk in that direction, until they hit a wall, or get themselves killed. Slide upward and they jump. Tap a mini Mario to have him stop and wait. Thankfully puzzle design is one feature that does live up to expectations. Each of the game's eight worlds introduces new elements to overcome and exploit, including rotating warp pipes, magnetic walls, and weight/counterweight platforms. The levels never got difficult enough for my taste (I cleared all 70+ with all Marios rescued in three days), but the volume and variety of levels at least kept things fresh throughout. 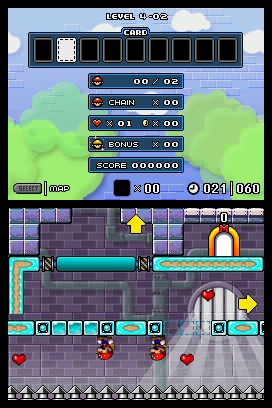 The stylus control also allows for most puzzles to take on a unique feeling from those in the original. You'll often have multiple mini Marios walking along different sections of a level, as you're frantically making sure they're all safe and all have a clear path to the goal. 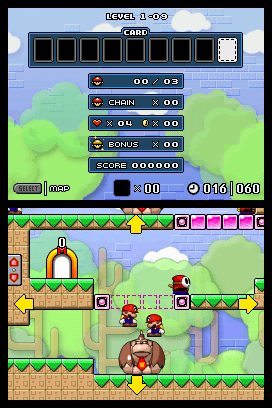 Earning a gold medal on any given level generally requires all Marios arriving at the goal at the same time, and keeping all Marios in motion for the entire puzzle - no easy feat in later levels. It's too bad the bonus for earning gold medals isn't more significant. No dozens of hidden levels are squirreled away this time around. Perhaps to make up for the lack of hidden, uber-difficult levels, Nintendo included a full map creation suite, and online sharing capabilities. You'll need to trade and enter friend codes with ever gamer you want to share maps with, gimping the system somewhat, unfortunately. Nintendo has implied that they'll be sharing some of the best fan-made maps themselves however, and indeed, two are already available for download, without any friend code entering necessarily. The Wi-Fi sharing itself works well and is for the mot part seamless, although it's strange that you're disconnected after every successful map download. A little more development time to polish some control quirks and hide away 20 or so super-difficult levels for the intrepid, and March of the Minis would have been a much more memorable DS release. Ultimately the finished product is a decent DS puzzler that falls short of being a must-own. What's Hot: Over 70 levels of devious puzzles. What's Not: Questionable touch-screen controls. Not many extras.